It was seven years ago when Abby Mallon first heard the three words that would change her life forever. Words that carry with them a host of baggage: fear, anxiety, worry, and pain. Words that bring a heaviness, a weight. Words that threaten to become who we are. After a whirlwind year of surgery and chemotherapy there seemed to be light at the end of the tunnel. Tests results were good. She’d beaten it. 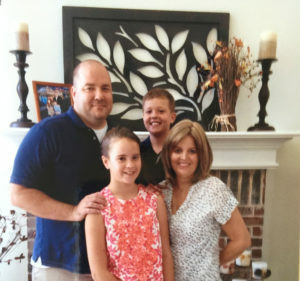 In 2014 Abby, her husband, and their two kids packed up their life in Virginia and moved to Keller. Before the move, a friend in Virginia mentioned that they had family going to a church called Milestone in the area. For Abby, it went on the back-burner. A few months into living life in Texas, a coworker mentioned to Abby that she attended Milestone. Abby started to wonder if God was speaking in each of these connections. In March of 2016, Abby went in for a CT scan after several months of back pain. She had no idea her world would change again in an instant. Those two words often hold more fear than the original three. It was bad this time. The cancer recurrence had spread to Abby’s liver and lymph nodes. She was given less than two years to live. We all have a limited amount of time on this earth, but for Abby this was real. Her days were numbered. When she heard her prognosis, she couldn’t ignore the gentle nudge from God to take a step. Amidst aggressive rounds of chemotherapy, in May of 2016, Abby and her family started attending Milestone. In August, Abby decided to join a small group even though she didn’t know a soul. In the group, Abby initially chose to keep her cancer treatments to herself. Truthfully, she was enjoying the anonymity. After several weeks of meeting together in the fall, God gave her the courage to share her story. Her group surrounded her, offered their support, and prayed for her healing. In January, Abby went to an appointment with her oncologist. Admittedly shocked, the oncologist delivered a few more words Abby never thought she’d hear again. Whether healing comes here on earth or in eternity, our identity isn’t found in our health or our sickness. We are not our disease, our job, our gift, our role, or our bank account. We aren’t defined by parenthood, career, marriage, singleness, or social status. Seasons and circumstances change, but we can be sure God’s character, how He sees us, and our identity in Him will not change. Who we are at our core is found in Christ. Abby and her family are continuing their journey of healing here at Milestone, in the context of spiritual family. Abby, we are so grateful you are here and for your transparency in sharing your story with us. We are praying for your continued healing and wholeness. I love this story. Gives me hope for many of the prayers I’m praying. Our identity has nothing to do with our health or sickness. So true! I love hearing testimonies of God’s miracles! Thank you for sharing! I know it will provide hope and encouragement to others who have also heard those dreaded words. Blessings to you and your family, Abby. Thank you for writing this beautiful Testimony. Our God is a great God. He will use our circumstances, to draw us closer to him and then use them again as a testimony of his power. We never know how he will use what we are going through to Glorify him. Sometimes it may not the answer WE seek, but even in those situations, we will not know until we meet our heavenly father and see the tapestry of our story, what purpose it served. Thank you sweet Abby for being transparent in this story and in our group. We love you. A true miracle! I’ve known Abby for a long time. She has a group of friends in VA and NC, and we’ve been with her through both fights. We have loved and prayed for her. She is one of us, and we know she’d be there for any of us as well. I love that she has re-established her relationship with the Lord. She is a true fighter. ? Abby, although we haven’t been a part of each other’s life for many years, you were in my prayers. I was fortunate enough to spend some time with your precious mom who was so overjoyed when speaking of your healing. It’s hard to accept those dark times when nothing seems to make sense. However, it sounds to me as if you have done just that. I can’t help but share a couple passages that convey the message in the above post about your miraculous journey and your response to it. God bless you and your family. Wow! Such a faith building story in many ways. Glad this family found spiritual and relational connection at Milestone and that we got a chance to witness the miraculous! This is so good. I’m reminded to keep praying for one of my family members who is battling cancer right now. Powerful. I appreciate your heart to return to the Source Abby. You are a model of humility and perseverance; thank you for the reminder of Who really matters.